Wayne Rooney has pleaded guilty to drink driving on a night out while his pregnant wife and their three sons were on holiday. The Everton striker was stopped by police when driving a woman’s black Volkswagen Beetle in Wilmslow, Cheshire, at 2am on September 1. 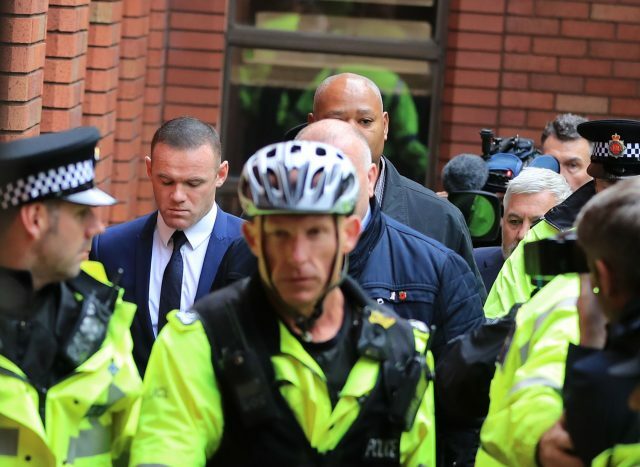 Rooney, 31, was later arrested and bailed and on Monday he entered his guilty plea at Stockport Magistrates’ Court. The former England captain was banned from driving for two years and ordered to perform 100 hours of unpaid work as part of a 12-month community order. In a statement issued to the Press Association after the plea he apologised for his “unforgivable lack of judgment”. He said: “Following today’s court hearing I want publicly to apologise for my unforgivable lack of judgment in driving while over the legal limit. It was completely wrong. “I have already said sorry to my family, my manager and chairman and everyone at Everton FC. Now I want to apologise to all the fans and everyone else who has followed and supported me throughout my career.